"F-07" is the third model in the new generation "F series" of the new generation which inherited the method, technology and thought input from Esoteric's flagship "Grandioso" series. Interviewer Yoshiyuki Ishida verified the ability of this machine as entry of the series. 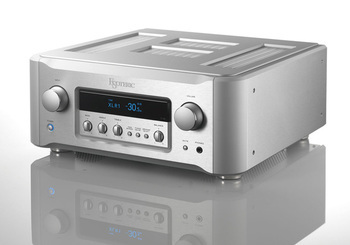 At Esoteric, a new challenge on integrating technology and know-how from Grandioso started with an integrated amplifier. In spring, this 30 W + 30 W (8 Ω) pure A class "F - 03 A" condensed 120 W + 120 W (8 Ω) high power machine "F - 05" as an integrated type. It is full-balanced, dual monaural configuration of all stages, and enough quantity is put in the power supply part and the cabinet. The new F - 07 is an AB class of 100 W + 100 W (8 Ω), which is a direct descendant of F - 05. The size of the panel and chassis remains the same, circuitboard, L+R independent full balance are shared as much as possible. The feel of operation is also similar, with both input selector and volume control developed from the same bearing mechanism found in Grandioso C1 which minimises vibration. Knobs are almost common as well, made from machined solid aluminum. Using the full balanced construction preamp and the independent L/ R dual mono aural, thus providing a sound that surpass its own class while achieving channel separation. As a whole, the F-05 and F-07's panel and size are the same. But the F-05 is 32kg while the F-07 is 27.2kg. Even though F-07 is lighter, it still packs a punch. The F-05 has EI model power trans 940VA but the F-07 has 633VA. Also, F-05 has the 3 tone controls for mid-range. But F-07 has the usual lows and highs but did away with the mute button. Even though both machines used machined solid aluminium for the knobs, the higher end one used diamond machining. Using a 633VA custom power trans, connected by thick cables and bolts, getting a low impedance, balancing the front portion of the power amp. 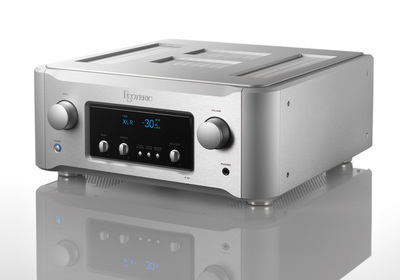 The low impedance also makes the output much cleaner, increasing the dynamic range while listening. Looking at the back of F-07, there is only one line input XLR, preamplifier output also omitted XLR, only RCA. Looking inside it is a thick aluminium and steel frame chassis called 3D optimized chassis structure, compartmentalizing each interior block by block and minimizing mutual interference and signal path. That is one of the features of Grandioso implemented into F-07. Although the transformer has been slightly miniaturized in the power supply section, the blocking capacitor for rectification is completely common in 10000 μF × 4, dual mono configuration. Internal structure. 3D optimized chassis and thick aluminium on the outer frame, which is the same design. The biggest difference besides the power output is that the output transistor is bipolar and has 2 parallels. F-05 has 3 parallel, but F-05 is changed to have continuous motion/action of 15A (30A at any moment), but they have the same heatsink. In addition, the pre-part has this MM, MC independent power supply, independent circuitry of dual monoaural, phono, equalizer, with the XLR1, RCA4 inputs as a full balance. The importance of full balance is shown by the scale of the volume, which has been increased by 4 times. This machine is also equipped with QVCS (Quad Volume Control System) which is also found in Grandioso C1. This is a 4 Circuit ladder resistance switching type, electronic controls are collectively controlled. So that LR and each of the hot / cold and a total of four Circuit with pure analog volume. These 4 circuits are similar in tone control. It also has a powerful headphone output compatible with a wide range of impedance. In addition, the main machine has an option board slot, which can accommodate this DSD to DA converter board (80,000 yen before tax). PCM, coaxial and light up to 192 kHz / 24 bits, USB B terminal is PCM 384 kHz / 32 bit and DSD 11.2 MHz, also can be used for high res conversion. Now, let's test this machine out! This time at the Esoteric listening room, we will be using TANNOY「Kensington/GR」 speakers and also SACD/CD player「K‐07X」also comparing with F-05, using a listening program. When the music starts playing, you'd be drawn in to this high-end world with a sense of relaxation. As expected, inheriting Grandioso's flow full of the quality, the 10-inch woofer is tightly and clearly driven, with enough margin to hear the bass. SACD / CD player "K-07X"
The glitter of the soloist harpsichord sounds glamourous like a metal string. The characteristics of a coaxial speaker are also obtained, in a clear sound image. Even the church recording has the sound presented as if immersed in the huge space. The playing of the orchestra as well as the songs and jazz vocals. The slimness and stretching of the sound doesn't lose to F-05, with its own naturalness and smoothness. The thickness of the orchestra's bass and the pizzicato of the contrabass, the momentum and dynamism are properly presented/transmitted. Low end is the one which yields half a step to F - 05, but the clarity of the higher registers are still accurately transmitted. This is especially felt when listening the the female jazz vocals, where the beautiful expression can be richly felt. This is the high end world, it leads to listening pleasure and enjoyment of the audio. The feeling when using the knobs is good, I especially want to make use of the tone control. It is true that it is large, but the heat generation is likely to be considered standard as AB class, so it seems no problem to insert it into the rack and use it. The ability to change the brightness of the display and font size is also similar to other high end machines. To reiterate, there will be space constraints to pair big speakers with this. For small to medium speakers, the tone control will be wonderful for the end user. Highest the bass at 63hz can go is ±12dB. On the other hand, the high range is 12 dB at 14 kHz, slightly lower than normal tone control, high frequency. Especially, it has a function to raise the low range by 2 dB or 2.5 dB, it is realistic and there is no sound quality deterioration, A sufficient bass sound can be obtained even with a small speaker.